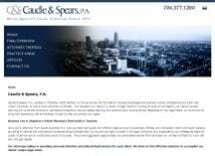 Charlotte, North Carolina Law Firm | Caudle & Spears, P.A. Since 1973, the law firm of Caudle & Spears, P.A., has served a diverse group of businesses and individuals as clients throughout North and South Carolina. From the owners of closely held local businesses to Fortune 500 companies, from personal injury victims to families with estate planning or tax advice issues, Caudle & Spears satisfies all of their legal services needs. The experience and diversity of the attorneys at Caudle & Spears, coupled with our smaller size, enable us to offer our clients a unique benefit – the ability to provide the highest quality legal representation as well as responsive personal service. From the initial consultation to the final resolution of each matter, we strive to ensure that our clients get extraordinary service and extraordinary value. Business law – We will help you with both laying the proper legal groundwork for your business and later managing its operations. We also provide the advice and prepare the documents that will help your business operate effectively, help keep its profits and assets protected, and help to minimize the possibility of legal disputes in the future. Business litigation – When your business finds itself involved in a lawsuit, we provide powerful and knowledgeable representation inside and outside the courtroom. Our skilled trial lawyers will manage any litigation that arises, allowing you and your business to stay focused on doing what you do best. Our litigation team will work hard to enforce your business’ rights and to help ensure it gets results that are financially beneficial. Estate planning – Planning for the inevitable is challenging. Our experienced attorneys have the knowledge and the experience to help any client make decisions about how best to utilize estate planning tools such as Wills, Medical Powers of Attorney, Living Wills, and Trusts. We help you make common-sense decisions about how best to protect your family’s finances and provide for their long-term security. Real estate – Details matter. Our attorneys can help you understand your rights, options and obligations before entering into any type of real estate transaction. Whether you are a buyer or seller, a landlord or a tenant, we provide the advice that will help you structure a transaction to your best advantage. We also prepare contracts, leases and other legal documents that will ensure your expectations are met and your rights are protected. Through our On-Line Eviction Filing Service, www.CSEvictions.com, we can also help Landlords looking for help evicting tenants quickly and efficiently. Taxation – The time and manner of any transaction can affect the tax obligations that may arise. Proper tax planning arrangements can help you reduce or eliminate your tax liabilities. Our tax attorneys can assist you with understanding and planning for these obligations, and we can help you understand and utilize the best strategies to structure and minimize your taxes. Other Areas – In addition to those listed above, our attorneys also regularly represent clients in many other types of cases, such as: personal injury claims; employment law counseling; construction defect claims; estate administration; trademark registration and defense; and many others. If you have a legal question, it is likely that one of our attorneys can answer it. In short, someone here can help you solve your problem. Contact Caudle & Spears, P.A. At Caudle & Spears, we strive to make sure that every client receives cost-effective and timely service, and gets the advice they need to protect their legal and financial interests. For immediate assistance or to schedule an initial consultation with one of our experienced lawyers, please call or contact our Charlotte, North Carolina, law offices today. NC Farm Bureau Mutual Insurance Co. If you are a business owner, you know the importance of maximizing your profits and protecting your investment. Our construction law attorneys successfully handle issues involving defects in construction or non-performance of construction contracts. Employment law is a highly complex area of law that is governed by a host of state and federal statutes. As an insurance claims manager or an insured policyholder, you want to ensure that you have aggressive and experienced attorneys to handle your personal injury and liability claims. Trust and estate planning tools are critical for individuals and families interested in protecting the future direction of their personal assets.